India win by seven wickets! Pandey swings his bat towards midwicket to hit the winning boundary! And its yet another Kohli masterclass that sets up a memorable chase for India! The hosts win with 10 balls to spare! CENTURY FOR KOHLI! His 26th ton in ODIs! Gets there with a single in the first ball of the 41st over. His love affair with Mohali continues! Lest we forget, he was dropped on 6 by Ross Taylor. Pandey smashes the next ball over the umpire's head for his second boundary! Meanwhile, Kohli is fourth in the list of most ODI centuries now. Less than 100 needed for the hosts now, with 15 overs and eight wickets in hand. Attempted yorker in the second delivery results in a full-toss, which Dhoni smashes near the bowler's head to bring up the 150 stand with Kohli. OUT! Henry finally gets the breakthrough for the Black Caps! Dhoni is disappointed to walk back to the pavilion for 80, chipping a slower ball outside off to Ross Taylor, who doesn't let go of the chance at cover. Brings the curtains down on the brilliant 151-run third-wicket stand. Manish Pandey walks out now. 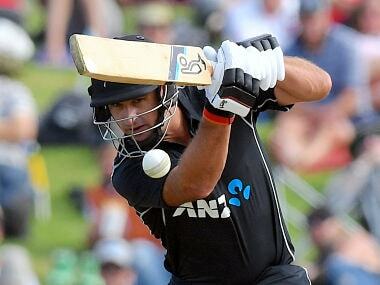 It was turning out to be a good over for New Zealand, with Neesham giving away just three, before Dhoni comes down the track and smashes the ball over the bowler's head for a straight, flat six! The powerful strike also brings up the 100 stand between these two! Meanwhile, Dhoni now has overtaken Sachin Tendulkar for the record for most sixes in ODIs by an Indian! FIFTY FOR MS DHONI! The Indian limited-overs skipper gets to the milestone for the 61st time in ODIs with a single. Both Kohli and Dhoni have complemented each other very well so far, with the latter being more aggressive in his approach. Southee back into the attack. Ronchi decides to move closer to the wickets in order to prevent Dhoni from coming down the track. Drops the move a couple of balls later. FIFTY for Virat Kohli, and he gets to his 38th ODI fifty with a boundary towards fine-leg, bringing up the 100 for India as well. Let's not forget, Kohli was dropped on 6 by Taylor earlier today. FOUR! Kohli goes for the cut, and manages to send the ball running away through the gap near point. Dhoni brings up the fifty partnership up a couple of deliveries later with a pull, sending the ball flying towards square-leg. Solid partnership this is turning out to be now! SIX! Dhoni brings up 9000 runs in ODIs in style, coming down the track and smashing Santner straight over his head for his first six in the innings! Dhoni is the fifth Indian batsman to get there! And its time for a drink at the centre! Big appeal from the keeper and Southee for a caught-behind against Kohli, though the umpire isn't too interested in it. OUT! Rohit disappoints yet again, getting trapped lbw by a slower one that raps him above the knee roll, with the point of impact being between middle and leg. The batsman has a disappointed look on his face, as India lose their second wicket with 41 on board. Meanwhile, MS Dhoni promotes himself to No 4 today! Looks like a call taken purely on the basis on the situation at hand. Rahane lobs the ball up towards mid-on, where the ball falls just short of the fielder. But he hammers away towards midwicket a couple of deliveries later to make up for it. Was in the slot for him to go for the attacking shot. OUT! What a soft dismissal for Rahane, going for a half-hearted drive that results in an easy catch for Santner at cover. India lose their first wicket with just 13 on board. Another bad outing for Rahane at the top of the order, and it won't come as a surprise if either Rahul or Dhawan replaces him there. Bumrah bowls the final over. Single off the second ball, with No 11 Boult getting off the mark in the process. BOWLED EM! The Black Caps fail to bat the 50 overs out, as Bumrah knocks Boult's off-stump over with a slower one! So India have 285 to chase now. Henry begins to step up the pressure from the other end, hammering a six and two fours in the over to get the Black Caps past the 280-run mark. Umesh however, manages to get the last laught at the end of the over, with Neesham miscuing a full-toss to give Kedar Jadhav a simple catch near extra-cover, bringing an end to the heroic 84-run ninth wicket stand. Just one over to go in the innings now. Henry brings up the fifty stand for the ninth wicket with a single down towards fine-leg. Can these runs prove to be the difference between the two sides. Neesham pulls the third ball towards midwicket for a four, moving to 46 before going for a couple of runs in the fourth ball. FIFTY for Jimmy Neesham! The all-rounder brings up the milestone for the first time in ODIs with an outside edge that sends the ball flying towards the third-man boundary for a one-bounce four! Umesh replaces Mishra, with pace from both ends now. BOWLED EM! No big score for Southee today! Southee drags this one onto his stumps while going for the pull! New Zealand lose their eighth wicket with 199 on board! Another bowling change that has worked well for the hosts! Matt Henry is the new man at the crease now. OUT! As Shastri just said, it looks like the Black Caps don't want to bat their quote of 50 overs out today. Santner gets a leading edge off Bumrah's bowling while going for an on-drive, and ends up giving Kohli a simple catch at point. New man Southee gets off the mark in the very first ball, getting two off it. Gets boundaries off the next two deliveries! Are we set for another Southee cameo today? OUT! And its a proper collapse now! Latham goes for a drive off a tossed up delivery from Jadhav outside off, and sends it straight into the hands of Pandya at short-cover! Jadhav gets his third wicket now, and New Zealand lose their sixth wicket with 169 on board. OUT! Lightning quick glove work by Dhoni — one of 'Captain Cool's' well -known traits — gets rid of Ronchi for just 1 off 4 balls! Flighted along off, Ronchi looks to drive this through the covers, but is beaten by turn yet again. His foot is a whisker outside the crease, and Dhoni whips the bails off in a fraction of a second! "Hands faster than a pickpocket" is how Ravi Shastri describes his glovework. Jadhav back into the attack. Can he get another breakthrough right now. FOUR! Powerfully struck by Anderson just wide of the umpire's head. Good use of the feet by the Anderson as well. OUT! What a comeback by the part-timer with the golden arm, firing a full toss outside off, and Anderson is cramped for room while looking for a big hit. Rahane takes a simple catch at mid-off, as the Black Caps lose their fourth with 160 on board. OUT! Taylor's run of glory ends at 44, getting foxed by the extra turn in Mishra's delivery. Taylor lunges forward while looking to play the ball pitched along leg towards his left, but is beaten by both flight and turn, with Dhoni whipping the bails off in a flash. Anderson is the new batsman at the crease now. Axar continues to bowl from the other end, after Pandya gets introduced in the 25th. FIFTY for Latham, his sixth in ODIs and fifth of this tour so far! He has got a match in a fifty in every match in this tour so far barring the 2nd ODI, where he was dismissed for 46. What a run of form for the southpaw opener! Taylor hammers a flighted delivery from Axar a couple of deliveries later through extra-cover! Latham goes for his signature sweep off Jadhav, reaching out for the delivery pitched wide outside off, and sending it scurrying away to the square-leg fence. OUT! Jadhav strikes again, and is turning out to be a talisman for skipper Dhoni! Straight one from him, and Williamson executes the sweep early, and gets rapped in front of off-stump. The Black Caps lose their second wicket with 80 on board. After Guptill, Latham gets into the act too, pulling the first ball over square-leg boundary to the third six of the innings so far. OUT! Guptill's entertaining innings finally comes to an end after failing to bring his bat down in time to a back-of-length delivery that raps him in front of middle and leg. The Black Caps lose their first wicket with 46 on board. Kane Williamson, the skipper, gets off the mark and brings up the fifty on board with a drive the down, wih a bit of misfield near mid-on. TOSS: It is India who win the toss YET AGAIN in this series, and no prizes for guessing for skipper MS Dhoni went for this time. 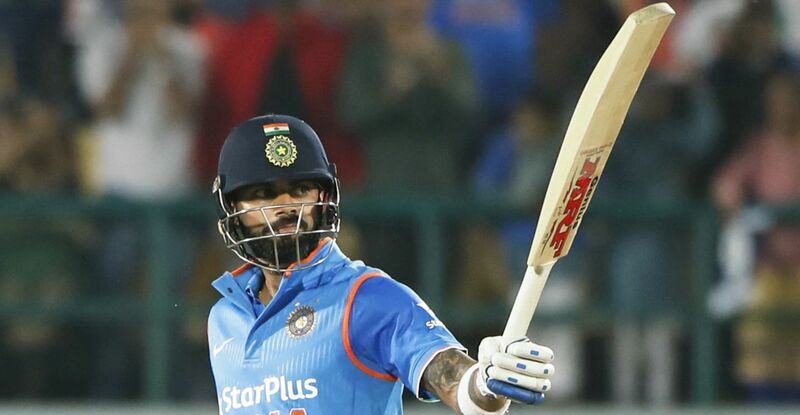 That's it from us for the third ODI between India and New Zealand at the PCA Stadium in Mohali, Chandigarh on Sunday. Kohli's century helped setup a special Sunday for Indian cricket fans, and the hosts now travel to Ranchi for the fourth ODI, having regained the series lead. Hope you enjoyed our coverage for the third game. We bid you goodnight! Virat Kohli: Bit of luck went my way as well. Felt sorry for Ross. Ive done that before, with Brendon getting to 300 as well. We gave away 30-40 runs too many, but that gave us an opportunity. The partnership with Dhoni sealed the game for us, and Pandey helped us finish things off. The way he (Dhoni) hit those two-three boundaries gave me the confidence. We fed off each other. In the past, I got the feedback that I need to time my shots, and I've maintained that. Me and MS had a chat. He took on the spinners. Teams try and get me out when I walk out at 3. that's when I take my to settle and analyse the situation. MS Dhoni: I think would've done better in the last game, but what matters is how you come back. I felt it was a very good game for us, especially the way the bowlers started off. Overall they have done really well. The surprise package has been Kedar. We can still improve, cause When you win, you brush a lot of things under the carpet. Ive no clue how he (Jadhav) gets the wickets, but its important that he is getting those wickets. There's no pressure on Hardik to finish his 10 overs. Ive batted lower down for a long time. That's where I lost my ability to rotate strike. Its important that I go out there and play the big shots. Well I think right from the start he's eomeone who wanted to improve. He's somebody who'se learnt a lot over a period of time. As far as getting better is concerned, its difficult to say what the top limit is. He has made not only his fans proud, but also his parents. Kane Williamson: Obviously frustrating to lose those wickets in the middle. The lower-order performed beautifully for us today. If you don't dismiss this man over here (Kohli), it doesnt matter how many runs you score. You have to dismiss them, as we saw today, they put on 150 and took the game away. Its part of the game. You wanna catch them all (on Taylor's dropped catch), but it doesn't always happen. MS Dhoni is the Jana Bankable Player of the match. This game was done at the 25th over. Both teams played it that way. Kohli and Pandey chose to stick to rotating the strike in Southee's final overs. The pacer finishes with figures of 10-0-55-1, with five coming off his last over. Jimmy Neesham returns to the attack, with the game nearly sealed in India's favour. FOUR! Kohli pierces the gap between cover and extra-cover with surgical precision (Ravi Shastri's words, not mine). Barring the momentary brainfade early in his innings, this has been as wonderful a knock by the Indian Test skipper as any of his other memorable knocks. Kohli and Pandey deal in singles in all six deliveries in over, with the latter also hitting the ball well. Meanwhile, the partnership between the two is in excess of 50 at the moment, the milestone of which was brought up in the previous over. Meanwhile, India cross the 250-run mark as well. Kohli pierces the first ball of the over through cover, with an Anderson misfield at the sweeper position resulting a boundary. Such misfields are only adding to the Black Caps' misery, given that things are hardly going their way at the moment. Kohli attempts to go for a lofted drive next ball, mistiming it, but the ball lands just short of long-off. Henry returns to the attack alongside Boult. Kohli runs a couple of doubles in this over, keeping the scoreboard ticking in case the boundaries don't come along. Pandey, too is providing valuable support at the other end. 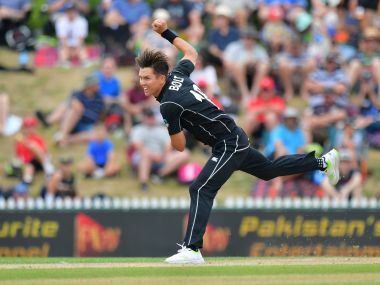 Boult returns to the attack. Late cut by Kohli in the second ball, beating the fielder at short third-man, getting his 11th boundary in the process. Pandey tries an uppercut a couple of deliveries later, but only gets a single. Wide off the final ball. Another good over for the hosts, with 10 coming off it. Southee back in the attack. Kohli attempts a drive in the fourth ball, getting an outside-edge over the backward point fielder's head in the process. Flicks it towards fine-leg for a boundary, before getting a single off the last ball to move to 99. Another 10 overs to go in India's chase right now. Santner finishes his quota of overs on an economical note, giving away just two in his 10th. Meanwhile, Kohli is nearing his century at the moment, and it will be yet another ton for him while chasing. Pandey gets off the mark in style, whacking the short ball from Henry over his head, both his feet off the ground at one point. Brings up the 200 for India a couple of deliveries later. Good over for the Indians, with nine coming off it. The hosts are still in control, despite Dhoni's wicket. Santner bowls his ninth over. Pandey struggles to pick the line of the left-arm spinner's deliveries, failing to get off the mark after facing six balls. Bit of mix-up between Kohli and Dhoni, with the former having to retreat after setting off for a quick one, but reaching his crease safely in the end. Quick single to end the over. Kohli gets a boundary off a shot quite similar to that in the last ball of the previous over. Slower one from Southee, Kohli just rolls his wrists onto this one, sending it wide of mid-on. Meanwhile, Matt Henry is starting to warm up in the deep right now. Three singles and a wide fetch runs for the hosts, before Kohli swings his bat towards the leg side in the final delivery to get his eighth boundary. The partnership is now worth 137. Excellent running between the wickets by Kohli and Dhoni, squeezing out a double from a tight situation. An absolute treat to watch them at work, especially the 35-year-old skipper who would put most youngsters to shame. And its time for drinks. Four singles scored in the over. Barring the occasional boundary, Kohli and Dhoni have dealt in rotating the strike between themselves. Kohli gets lucky once again, getting a thick outside-edge off a slower one from Henry, although the ball travels towards the vacant fine third man region. Five runs scored in the over, with the hosts looking solid at 159/2. A quiet over, compared to some of the recent ones where the pair were scoring runs freely. Just two runs off it, with both batsmen batting in the 60s right now. Most 6s by an Indian in ODIs. Most 6s by a captain in ODIs. Boult back into the attack. FOUR! Dhoni pulls towards midwicket, before taking a single to bring up the 150 for India. The hosts are cruising right now! Four singles in the 25th over, with India getting to 130 without losing any further wickets at the halfway mark in their innings. Henry back into the attack, and gives away two singles along with a boundary off a cut in the last delivery. Dhoni, who executed the cut off the last ball to get the boundary, moves to 47 now. Santner gives away four singles in this over, with Dhoni slowly moving towards his half-century right now. Meanwhile, the hosts are back in the race right now, after a brief blip in which they lost two quick wickets. 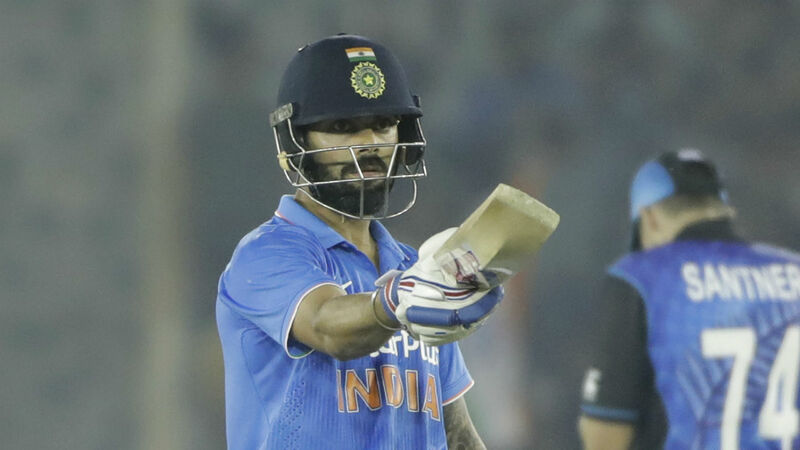 Kohli gets a bit of bat to a slow bouncer from Southee, but the ball lands short of keeper Ronchi. Meanwhile, Ronchi seems to have adopted the strategy of moving closer to the wickets exclusively for Dhoni. Couple of wides towards the end of the over. SIX! Not hit from the middle, but Dhoni manufactures enough power in the shot to send the ball straight over Santner's head for his second six! 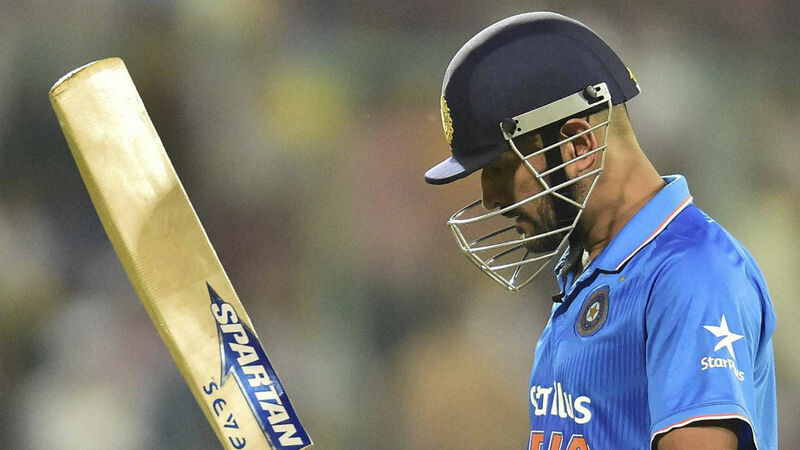 Eight runs off the over, with Dhoni now looking at his half-century. 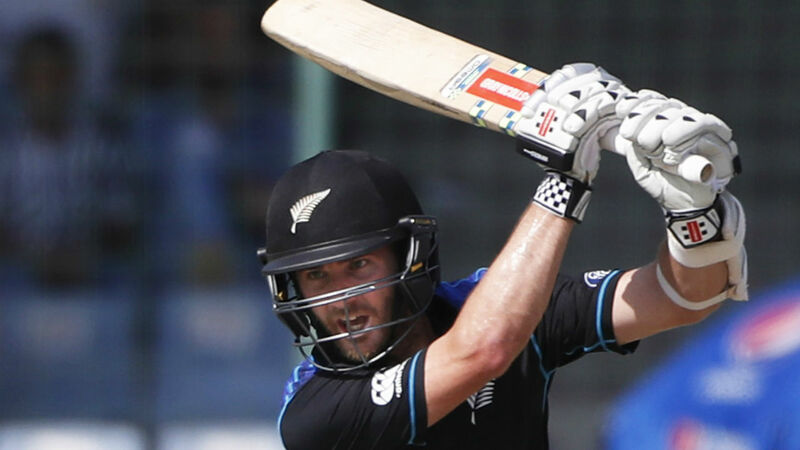 Preview: Stung by an improved New Zealand on Thursday, a wary India would like to quickly get their house in order when they square off with Kane Williamson's boys in the third ODI in Mohali on Sunday. While the six-run defeat in Delhi has given India plenty to ponder about, it has also renewed interest in the contest which had been dominated by the home team prior to Thursday, stretching from the one-sided Test series to the first ODI in Dharamsala. From a New Zealand point of view, a victory was all that they needed after a string of defeats. As a result of their first win on Indian soil in 13 years, one can expect a certain spring in the stride of the visitors when they take the field at the PCA Stadium. India, on the other hand, can only blame themselves for suffering a rude shock after failing to chase down a 243-run target, a total they were expected to overhaul with little difficulty. As captain MS Dhoni put it, the hosts would have won the match had some of their batsmen had made an extra 10-15 runs instead of getting out at crucial junctures. Ajinkya Rahane, who has got the opportunity to cement his place in the ODI side in the absence of injured Shikhar Dhawan, squandered starts in both the matches while opening alongside Rohit Sharma, who would also be keen to be back among the runs after a couple of failures. Rohit had hurt his biceps during the last match but there hasn't yet been any news about the extent or seriousness of the injury. Number four Manish Pandey also need to make an impact after he too could not capitalise on promising starts. In fact, most batsmen got their eye in at Kotla before throwing their wicket away, hurting India's chances badly. One of them was number six Kedar Jadhav, who impressed with his 41-run cameo and shared a 66-run fifth wicket stand with Dhoni. Had he been alongside Dhoni for another three-four overs, the outcome of the match could have been different. Jadhav may get another chance tomorrow as there is still no update on Suresh Raina's health. With most batsmen not showing the required maturity to bail the team out of a tricky situation, it would be a tad unfair to only point fingers at Dhoni, who was made to work hard for his 39 before falling to a brilliant return catch by Tim Southee.